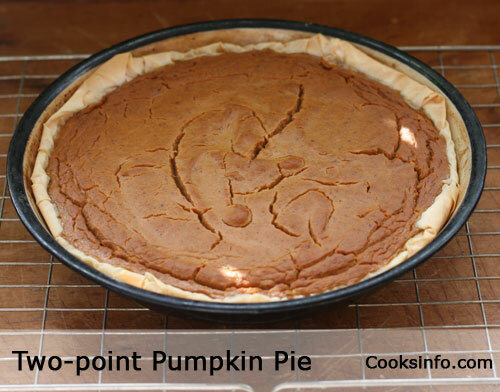 This pumpkin pie has the classic pumpkin pie taste that everyone loves, but it's lost a boatload of calories so you can indulge in it without giving it a second thought. This skinny pumpkin pie is just an incredible 2 Weight Watchers PointsPlus® per generous slice -- that's 1 point less than a tablespoon of butter! As an added bonus, this pie is quick to assemble, and though it takes an hour to bake, none of that time needs your attention. Pair this up with some fat-free Cool Whip®. Mix everything from the canned pumpkin down to and including the cloves together. Set aside. Lightly spray a 9 inch (22 cm) pie pan with cooking spray. Use the 3 sheets of phyllo to line it. Have the extra length from each sheet fold over back into the pie plate at a different part of the pie plate for each sheet. Pour in the pumpkin mix, bake for 50 to 60 minutes until a knife in the centre comes out clean. Let cool completely before slicing and serving. There are a total of 16 Weight Watchers PointsPlus® in the recipe. We used a sodium substitute for the salt. Per A slice that is 1/8th of the pie.